As per my birthday request, we went to Tokyo DisneySea and Disneyland during our trip. Those are pretty expensive attractions, which meant that we looked especially for low-cost things to do during the rest of our stay in the city. What's really cool is that entry prices for many exhibits in Tokyo are quite inexpensive. Here's a recap of our budget-friendly adventures, which obviously will not include the Disney days--that will be a completely different post, ha! Meguro Parasitological Museum - Free! The very first place we visited in Tokyo was a museum all about parasites! Please note, we went there as part of Angel's birthday request. It wasn't my cup of tea at all, but he found it very fascinating. I closed my eyes through as much of the museum as I safely could. It's very small, but it's walking distance from a train station and easily accessible. A good visit if there's someone in your party whose excited by the prospect of viewing insanely long tapeworms and other terrible things. Next time, I think I'm delegating the job of taking Angel to parasite exhibits to someone else. Any volunteers? Well, I should say it's free to explore. Shopping in Shibuya is certainly not free! The area around Shibuya station is where you can view the famous Hachiko statue. There are lots of interesting malls in the area to explore, along with plenty of restaurants. We had lunch at Kamakura--which only set us back about $9.50 USD for a set of noodles, rice, and dumplings, which we split, and was a very filling meal for the both of us. Similar to,and yet completely different from, a museum about parasites, this is a very specific, small museum that caters to enthusiasts on a particular topic. I happen to be a passionate fan of dollhouses, I even own one back in the USA, so I was very happy to stop by here. Angel was happy to, because he wanted a break from walking. He sat on a bench while I entered the exhibit. I actually just visited the special dollhouse exhibit, which was only a 200 yen entry fee, making the museum even more budget-friendly. I loved seeing the tiny things, and the variety of both western and eastern minatures was lovely. The Hikawa Maru is a passenger ship that was in use from the 1930s until 1960. You can tour the whole ship for a ticket price of less than $3 USD!! How cool is that??!! We spent several hours exploring every part of this boat, from the engine room to the captain's quarters. I loved playing with the telegram. I'm not sure I would be very good at the rhythm required for Morse Code. On the gorgeous stairways and in the luxuriant 1st class dining hall and smoking room I felt a bit like I were touring the Titanic (which, I know, is impossible). We also got to see an 8-bed room in 3rd class and realistically noted that that's where we'd be traveling with our family if we'd had the notion to cross the ocean back in the day. It makes sitting in an economy seat in the back of an airplane for 13 hours sound not bad at all! This museum was another birthday request of Angel's. He loves instant ramen--and sometimes wishes I cooked less often so that he had more excuses to eat it. Here we learned about Momofuku Ando and his process of inventing first a method of drying ramen noodle with hot oil, so that they could be sold in packed as instant ramen, then, later on, he invented Cupnoodles and Space Ramen. On our last day in Tokyo, we went to the Tokyo National Museum. It's a large museum complex with multiple buildings, and is beautifully and elegantly designed. The collection of artifacts is quite impressive, as they have artifacts not only from Japan, but also from the rest of Asia as well as from the Middle East and Africa. They had a mummy! And a great deal of art, as well as Japanese clothing and jewelry. Angel was hoping they'd have more exhibits on modern Japanese history, but this museum is definitely primarily focused on the long-ago past, we didn't see much if anything from the 1900s onward. The ticket price is definitely a good value for the beauty and interesting information about all the artifacts present. Tokyo is a great city to wander around. If you're completely new to the place like we are, you never know when you'll run into a Tamagochi store, a flea market, lotuses that appear to be taking over the whole pond and maybe the world after that, or an interesting cemetery. And when it's time to go, if you're lucky enough to be flying out of Haneda Airport, they have an awesome rooftop observation deck where you can stand outdoors, enjoy the breeze, and watch planes land and take off. I have never been to an airport with anything like this (and I've been to a lot of airports...). It was so cool, and a fantastic way to say "goodbye!" to Tokyo. What kinds of things do you like to do on vacation to help stick to your budget? Thanks for sharing your trip photos! I really hope to make it there someday and will most definitely be on a budget! This looks like such an amazing vacation! That ship would be so much fun to explore. Really, all of this looks like tons of fun-even the parasite museum would be interesting, I think! If I ever make it to Japan (which I hope to someday) I will keep these ideas in mind! I'm all about budget travel :) When my husband and I travel-especially abroad-we love to hit up grocery stores for our meals. It's usually so much cheaper than going out to restaurants for every meal (we do go to restaurants while traveling, but more like once a day instead of for all three meals). Plus, it's really exciting to see what kinds of foods are in foreign grocery stores! Wow, there really is a museum for everything! Most of these look really cool (except, I'm with you...no thank you to the parasite museum). Can't wait for your Disney post - Tokyo is the international Disney park I most want to visit! I would really love to go to Tokyo one day! It's definitely high up on my bucket list but I have to gear myself up for the long flight! Thanks for sharing this tips, I'll have to keep them in mind! How awesome! Makes me want to go back to Japan! This looks so amazing! I've always wanted to visit Japan. I will have to keep these tips in mind when we finally get there. My husband lived in Japan for 3 years and really wants to go back for a visit. We'll have to add it to our list! Amazing pictures! I would love to visit Japan! Tokyo looks and sounds amazing! Tokyo has been on my travel wishlist for so long now! There's so much culture and cool gadgets that I NEED to see aha. I have always wanted to go to Japan!! I think I would really enjoy the museum about parasites hahahaha! Your time in Tokyo looks wonderful! I have always wanted to visit and your pictures that confirmed that desire! Thank you for sharing your adventure on a budget! How did you know that Tokyo is totally on my bucket list? Seems like an amazing city. The only thing that would be hard for me would be the food! I'm not in Japanese food at all. Tokyo looks amazing and the sights you visited look very interesting! The Cupnoodle museum I will have to see if I ever get to visit Tokyo :) Thank you for stopping by my blog earlier! I'm so thankful for this post! 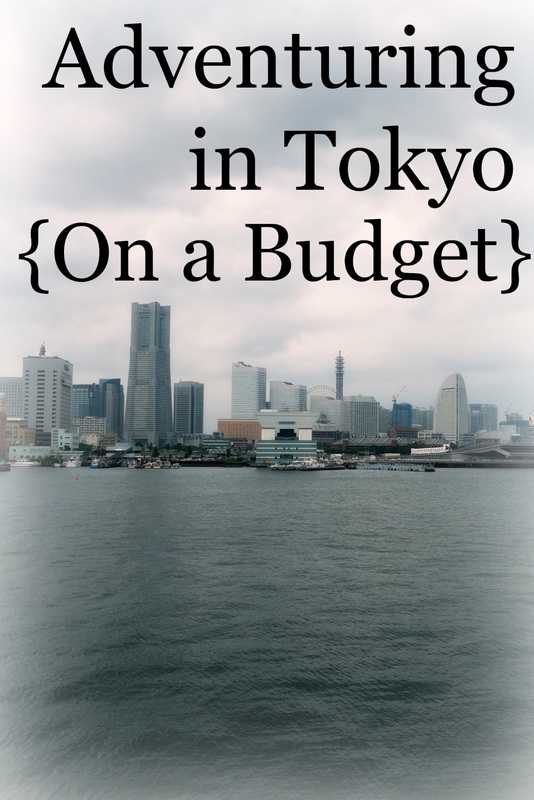 I'm currently planning a trip to Tokyo and I've been looking for tip on places to save a little extra. All of theses museums look awesome! Beautiful photos of your Tokyo trip! I have always wanted to visit Japan. The Cup Noodles Museum looked like it was a lot of fun!